Research concerned with sustainability and sustainable development is progressing fast. Simultaneously, activities within industry, government and academia are becoming more globalized. Successful research requires interaction with multiple partners around the world. We are facing an obvious need for new types of communication within our scientific community. Sciforum.net electronic conferences provide a platform for fast exchange of the latest research findings, as well as a possibility for global meetings with no limitations related to traveling. 1. Environmental Sustainability (Section A). 2. Economical Sustainability (Section B). 3. Social Sustainability (Section C). 4. Renewable Energy Self-Sufficiency (Section D). 5. Energy Return-on-Investment (Section E). 6. Governance & Sustainability (Section F). 7. Sustainability Assessment and Policies (Section G). This inter- and multi-disciplinary conference aims to examine, explore and critically engage with issues related to recent insights and advances in these topics. In particular, the conference will encourage both theoretical and practical debates surrounding environmental, economical and social contexts for those who want to go beyond the buzzword. The conference will be completely free of charge―both to attend and for authors to publish―and is sponsored by MDPI and the scientific journal Sustainability. Selected papers will be published in the journal Sustainability. The 1st World Sustainability Forum Conference will be held at www.sciforum.net, a new platform developed by MDPI to organize electronic conferences for scholars. Please submit your abstract with max 2500 character (in English) by October 1, 2011. Abstracts should be submitted online at www.wsforum.org. All submissions will be reviewed by our scientific committee. For accepted abstracts, a full draft paper should be submitted by October 30, 2011. 1. Scholars interested in participating with the conference can submit their abstract (about 200-300 words covering the areas of manuscripts for the proceedings issue) online on this website until 1 October 2011. 2. The Conference Committee will pre-evaluate, based on the submitted abstract, whether a contribution from the authors of the abstract will be welcome for 1st World Sustainability Forum. 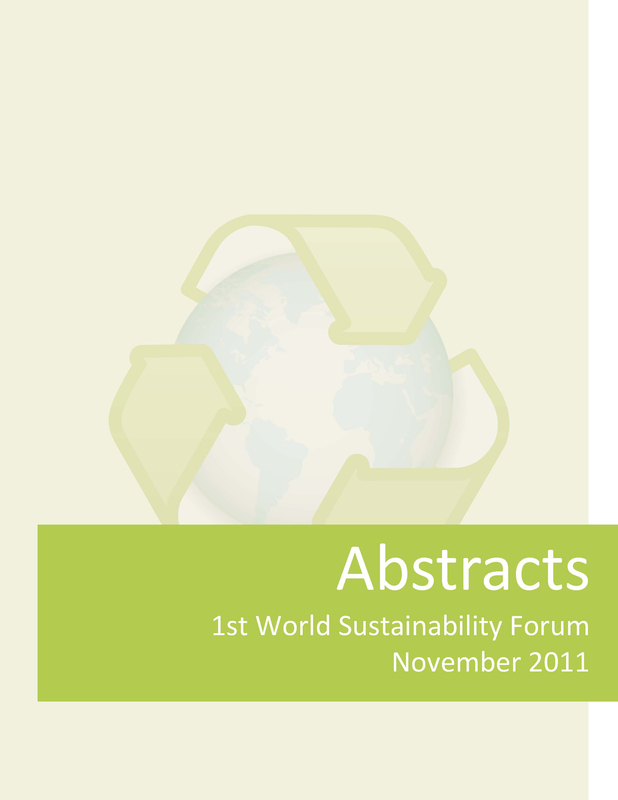 All authors will be notified by 15 October 2011 about the acceptance of their abstract. 3. If the abstract is accepted for this conference, the author is asked to submit his manuscript, optionally along with a PowerPoint and/or video presentation of his/her paper, until the submission deadline of 31 October 2011. 4. The manuscripts and presentations will be available on www.wsforum.org for discussion and rating during the time of the conference 1 – 30 November 2011. 5. The Open Access Journal Sustainability will publish the proceedings of the conference as a Special Issue. After the conference, the Conference Committee will select manuscripts that may be included for publication in this Special Issue. Five of the manuscripts with the highest scientific quality will be published free of charge following a successful peer-review. Manuscripts should be prepared in MS Word or any other word processor.The publication format will be PDF. The manuscript should count at least 3 pages (incl. figures, tables and references). There is no page limit on the length, although authors are asked to keep their papers as concise as possible. Submission: Manuscripts should be submitted online at www.wsforum.org by registering and logging in to this website. • Paper Format: A4 paper format, the printing area is 17.5 cm x 26.2 cm. The margins should be 1.75 cm on each side of the paper (top, bottom, left, and right sides). • Formatting / Style: The paper style of the Journal Sustainability should be followed. You may download a template file to prepare your paper. The full titles and the cited papers must be given. Reference numbers should be placed in square brackets [ ], and placed before the punctuation; for example  or [1-3], and all the references should be listed separately and as the last section at the end of the manuscript. • Authors List and Affiliation Format: Authors' full first and last names must be given. Abbreviated middle name can be added. For papers written by various contributors a corresponding author must be designated. The PubMed/MEDLINE format is used for affiliations: complete street address information including city, zip code, state/province, country, and email address should be added. All authors who contributed significantly to the manuscript (including writing a section) should be listed on the first page of the manuscript, below the title of the article. Other parties, who provided only minor contributions, should be listed under Acknowledgments only. A minor contribution might be a discussion with the author, reading through the draft of the manuscript, or performing English corrections. • Figures, Schemes and Tables: Authors are encouraged to prepare figures and schemes in color. Full color graphics will be published free of charge. Figure and schemes must be numbered (Figure 1, Scheme I, Figure 2, Scheme II, etc.) and a explanatory title must be added. Tables should be inserted into the main text, and numbers and titles for all tables supplied. All table columns should have an explanatory heading. Please supply legends for all figures, schemes and tables. The legends should be prepared as a separate paragraph of the main text and placed in the main text before a table, a figure or a scheme. 1. Scholars interested in participating with the conference can submit their abstract (about 200-300 words covering the areas of manuscripts for the proceedings issue) online on this website until 1 October 2011.2. The Conference Committee will pre-evaluate, based on the submitted abstract, whether a contribution from the authors of the abstract will be welcome for 1st World Sustainability Forum. • Submission: Manuscripts should be submitted online at www.wsforum.org by registering and logging in to this website. Sustainable development (SustD) – meeting the needs of the present without compromising the ability of future generations to meet their own needs – has become a major issue of focus for business, government, and society generally, at local, national, and international levels. Evidence abounds of the increasing extent to which the business sector is embracing the SustD concept – the UN Global Compact (http://www.unglobalcompact.org/), the work of the World Business Council for Sustainable Development (http://www.wbcsd.org/), the Equator Principles for the banking sector (http://www.equator-principles.com/), and the increasing uptake of sustainability reporting (http://www.globalreporting.org/) are just a few examples. But the current mainstream SustD narrative, as it is formulated in business and political circles, is only one approach to how humanity might go about living sustainably. But is it the one most likely to see a sustainable world come about? Are we really heading in the right direction? This paper critiques the current dominant SustD approach using socio-ecological resilience theory, and the Ecological Footprint measure in conjunction with the I=PAT identity. It considers current and future Ecological Footprint trends, and how key SustD strategies directed towards human population numbers, economic growth, and technology solutions, interact to progress or retard the achievement of a sustainable world. Socio-ecological resilience theory is used to explore the extent to which mainstream SustD either builds resilient societies and ecosystems, or undermines resilience leaving society vulnerable to broad-scale social and ecosystem collapse. The paper argues that mainstream SustD is challenging to believe as credible. Rather than helping society achieve needed change, this approach instead creates a false sense of progress that acts as a barrier to the more decisive action that is necessary to address the underlying drivers of humanity\'s unsustainable behaviours. Further, some of the core technology strategies advocated by this approach, and on which the business sector focuses its sustainability efforts, are shown to have flow-on effects that can work against the very objectives they seek to achieve. The paper concludes that the business sector has the power and influence to drive needed change, and can do so by embracing a more transformational sustainable world approach in both its internal activities and in its advocacy in the broader public and political space. Although focusing on the business sector, the findings of this critique are equally relevant to other social actors in their pursuit of sustainable world outcomes including governments, religious organisations, educational institutions, NGOs, communities, and individuals. What is needed is for business, political, and community leaders to take a stand and rally together to drive needed change. The UK National Health Service (NHS) overall annual carbon emissions is estimated to be around 21 million tonnes; producing 250,000 tonnes of waste a year with 80% of this waste going to landfill. Examples of good practice in addressing sustainability and climate change are found within healthcare. However these require changes in mindset, including values, attitudes, norms and behaviours which are required along with clear definitions of the problems faced in terms of economics, society and culture in order to respond positively to change. Initial investigations of the literature indicate that behaviour change theory may provide a feasible means of achieving constructive changes in clinical waste management; such approaches require further investigation. Aim: This paper describes a feasibility study designed to examine issues that might affect the introduction of a behaviour change strategy improve waste management in a healthcare setting. Methods: Guided by the evidence gained from our systematic review, 25 interviews were carried out with senior managers, clinicians and support staff involved in the management of healthcare waste from a broad range of agencies in South West England. Interviews were audio-recorded and transcribed for analysis. Thematic content analysis was conducted in order to identify key issues and actions. Data extraction, coding and analysis was cross checked independently by the four members of the research team. Findings: Initial findings suggest tensions, between Government and local policies, between organisations and individuals, and between the operational requirements of health and safety and maintaining appropriate and ethical patient care. Originated from financial reporting context, the concept of materiality has been applied in and contributed to sustainability reporting, by identifying, selecting, and prioritizing sustainability issues with significant impacts. This paper identifies two dilemmas that traditional stakeholder-approach confronts, and then analyzes how materiality-approach delivers advantage by addressing the dilemmas. This paper further observes two challenges for materiality-approach reporting: complexity interrelationship of sustainability issues; and subjectivity in materiality assessment. It argues that the two challenges are inherent and basic concerns for current sustainability accounting. This paper concludes that the road of materiality to sustainability reporting would be advanced with the progress of coping with the challenges. That is, extending our insight on the complex interrelationships of sustainability issues, and on subjectivity in materiality assessment, we would not only embrace a better materiality model to future effective sustainability reporting, but also open a door to view the fundamental theoretical concerns in contemporary sustainability accounting. The main aim of the review is to build a general understanding about how corporate sustainability researchers propose evaluating corporate sustainability and how the proposed models and frameworks changed over time. The review is done from the perspective of several aspects, focusing on the methods, tools and models proposed for corporate sustainability assessment, noting the business level of evaluation (the company level, a broader industry of value chain level, or a narrower product or process level). Other two aspects of the research were the definition of sustainability in the proposed models with regards to sustainability dimensions, and different empirical studies executed using the theoretical models proposed. The review includes 30 papers, focusing on corporate sustainability evaluation, assessments and measurement, published from 1997 to 2010. The role of businesses in the journey towards society\'s sustainability is very important, as businesses are an integral part of the society, it has the resources, it is fast and can make rapid changes, it knows how to unite the people inside the company for the goals it sets and works with efficiency in mind. Nevertheless, businesses might not have the professionals and the sustainability scientific knowledge to set the sustainability vision, goals and lead the way. Help and assistance is needed from the management scientists proposing user friendly management models, that are scientifically sound and based on the sustainability principles, but at the same time easily understood by the managers, that are business visionaries and business professionals, but not necessarily sustainability professionals and scientists. Based on the critical analysis of existing business sustainability management models and their advantages and disadvantages, an expanded and detailed business sustainability strategic management model is proposed, in which each step of the model is elaborated to make it as business management friendly as possible. The three sustainability dimensions (environmental, social and economic) are expanded in the model adding the political dimension, which is recognized as the overarching dimension, and political criteria are proposed to be used in the journey towards a sustainable society. 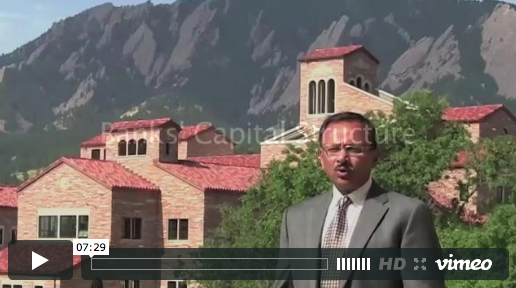 This is a follow-up to Sanjai Bhagat's video on bank executive compensation. Bhagat, a finance professor at the Leeds School of Business, argues that U.S. banks should be funded with more capital and less debt and that the current standards for such funding are dangerously low. This video contains a Keynote Presentation for the 1st World Sustainability Forum, prepared by our Chairman Prof. Dr. Marc Rosen from the Institute of Technology of the University of Ontario, Canada. This e-Book provides abstraction the subject of sustainability so that any title that interests you could be enlarged and read. <br/> Alternatively, you could download the PDF version.